Learn to make Restaurant Style Dal Makhani Recipe | How To Make Punjabi Dal Makhani Recipe with the step-by-step video tutorial. Dal makhani aka ‘maa ki dal’ is a side dish which is well known for its silky, melt-in-mouth texture and the classic and aromatic flavors. 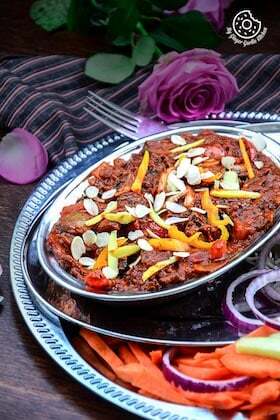 In simple words, I can say that this is one of the most exotic recipes from the Punjabi cuisine. 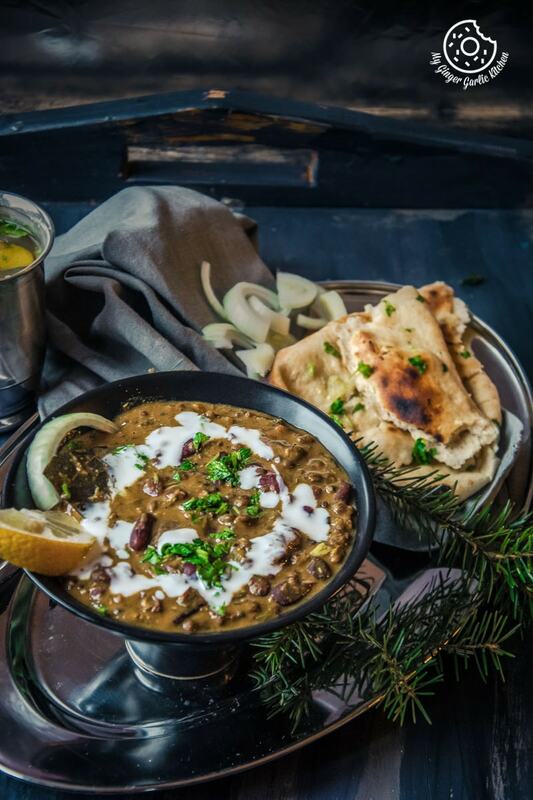 Who wouldn’t love a bowl of warm dal makhani topped with cream/ghee. Pair it with some hot naan to make it an ultimate comfort food. So finally the Spring-like weather is here, or at least it feels like Spring. Thanks to the dazzling sunlight which is ultimately here to bless us. Though, it’s still cold, but who cares as long as the sun is shining. Right? Many of you know that I love making and eating curries. I just can’t help it. You know, I love spicy flavors or I should rather say that eating spices is in my genes. 🙂 So let me take you to the curry world I sometimes live in. I am sure a lot of you might have heard of Dal Makhani (पंजाबी दाल मखनी ). You might have tried it at Indian restaurants. Still not getting what I am talking about? Dal Makhani is an Indian style flavorful and creamy lentils curry which originated from the Indian region of Punjab. Dal makhani aka ‘maa ki dal’ is famous for its smooth silky texture and the classic aromatic melt-in-mouth flavors. In simple words, I can say that this is one of the most exotic recipes from the Punjabi cuisine. The word Makhani stands for ‘buttery’ and the word ‘Dal’ means lentils — pronounced as daal makh-nee. So this Dal Makhani is the literal translation of Buttery Lentils. 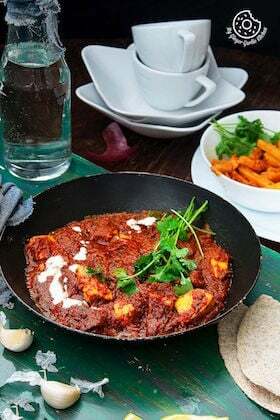 It’s a very popular Indian dish which is typically served alongside naan or rice. So today I am showing this so admired Indian recipe which is of course not invented by me, but I can surely tell that this particular recipe is the result of my successful experiments over many years. My today’s recipe is adapted to perfection over this time. Traditionally, the dal makhani is cooked over low heat overnight and thereafter allowed to thicken. But thanks to the modern pressure cookers – they make lives easier. 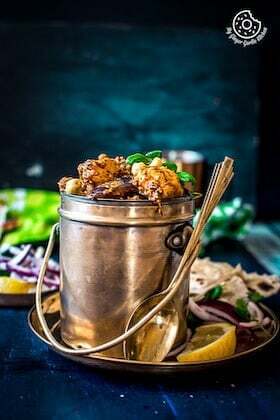 In my restaurant style recipe, soaked rajma (kidney beans) and sabut urad (whole black grams) are cooked along with some ginger-garlic, onions and whole spices in a pressure cooker until soft. Then they are tempered in butter with onion, some more ginger-garlic, and spices and mixed with milk, or fresh cream. Now what I do is I usually make a large batch of this curry in the evening for dinner and I save some for the following day’s lunch. At this point, you might be wondering, why I don’t make it fresh every time. Frankly speaking, it tastes even more delicious the next day. The marination of spices along with butter + milk/cream takes it to a whole new level. I personally find dal makhani tastier when it’s not entirely fresh. Well, this is the SECRET I’ve learned over the years. How To Make A Perfect Dal Makhani or Punjabi Maa Ki Dal? I am making Dal Makhani as long as I could remember. But I’ve always wondered why I don’t get that Restaurant style taste at home. Honestly speaking, I struggled to make it the way I liked the most. I always find that there was something missing in Dal Makhani which we make at home. Then one of my friends who had a family restaurant told me the secret of making the perfect restaurant style Dal Makhani. She said that in the restaurants they make this dal ahead of time and later they reheat the dal with some butter (and or chili) at the time of serving. The resting process let the spices marinate and the addition of butter at the time of reheating brings out the fresh aroma and helps in giving it an exemplary creamy and buttery texture. Yes, a bowl of dal makhani is always healthy and so comforting. Dal makhani is a flavorful lentils dish consists of Rajma and whole urad which are full of protein, calcium, and other nutrients. Thus, this dal helps in the maintenance body cells and keeps the healthy bone structure. Addition of tomato purée adds a little sharpness to this ‘Dal Makhani’, and it also enhances the vitamin A. What is in dal makhani? Dal makhani. Dal makhani or dal makhani (pronounced daal makkh-nee, “buttery lentils”) is a popular dish from the Punjab region of the Indian subcontinent. The primary ingredients are whole black lentil (urad), red kidney beans (rajma), butter and cream. What can we eat with dal makhani? You can enjoy dal makhani with a freshly cooked garlic naan, tandoori roti, or even rice. For a good presentation, you can decorate each serving bowl with some cream or a dollop of butter/yogurt and some cilantro leaves. Which cream is used in dal makhani? Fresh milk cream is added to the authentic Dal Makhani. You can also use store-bought cream or full cream milk. Dal Makhani and Dal Bukhara both look, feel and taste almost the same. But there is a slight difference in Dal Makhani and Dal Bukhara — and that is the cooking process and ingredients. Dal Makhani is slow cooked on the stove for about 30 minutes whereas, Dal Bukhara is slowly cooked for long hours in Tandoor or oven. Which Daal is used in dal makhani? 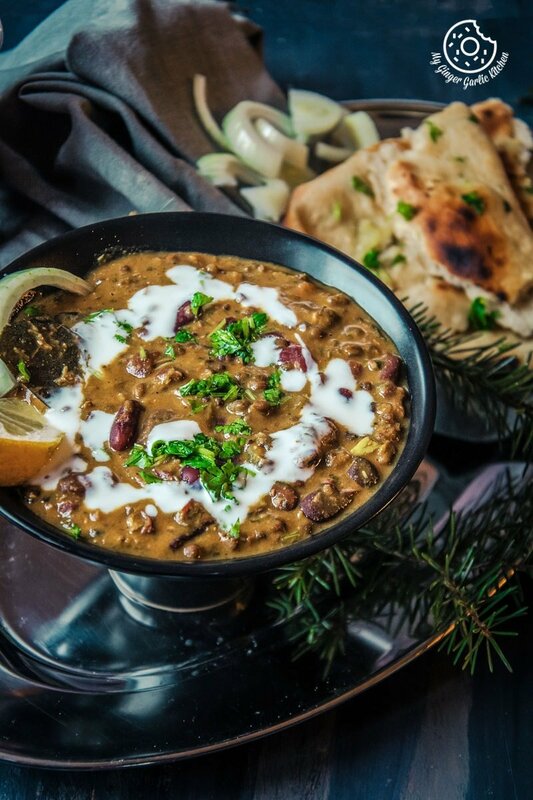 Dal makhani is a dish made using two types whole black lentil (urad), red kidney beans (rajma). Then there is a lot of butter or ghee (clarified butter), cream, tomatoes, along with some spices which go into this flavourful dish. The traditional recipe of Dal Makhani has ghee/butter, and some cream. Thus, this is not vegan. 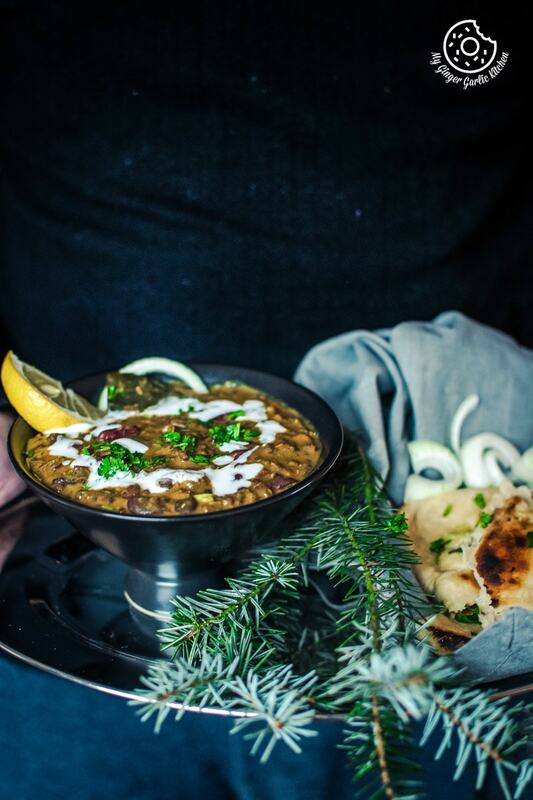 However, making a vegan version of this non-vegan dal makhani is damn easy. Can I make Dal Makhani with split urad dal? Authentic Dal Makhani requires whole urad, but some people use split urad dal. So the answer is YES. For making Dal Makhani in Instant Pot, use black gram lentils aka sabut urad and red kidney beans aka rajma for this recipe. Soaking both the lentils and beans in water for at least 4 hours or overnight. You can soak them together or individually. Rinse them well. Start with sautéing butter, cumin seeds and in the Instant Pot. When they start to splutter, add ginger, garlic, and onion and sauté till they become golden in color. Add tomatoes and spices, and sauté for 3-4 minutes. Now just stir in the soaked beans and milk/water, and set to pressure. Add some butter and garnish with cilantro leaves. How to make a dal makhani? How do you make Dal Makhani? Dal Makhani curry is usually made with lots of butter and cream. However, I normally replace cream with whole milk. And frankly, I haven’t found any significant difference. 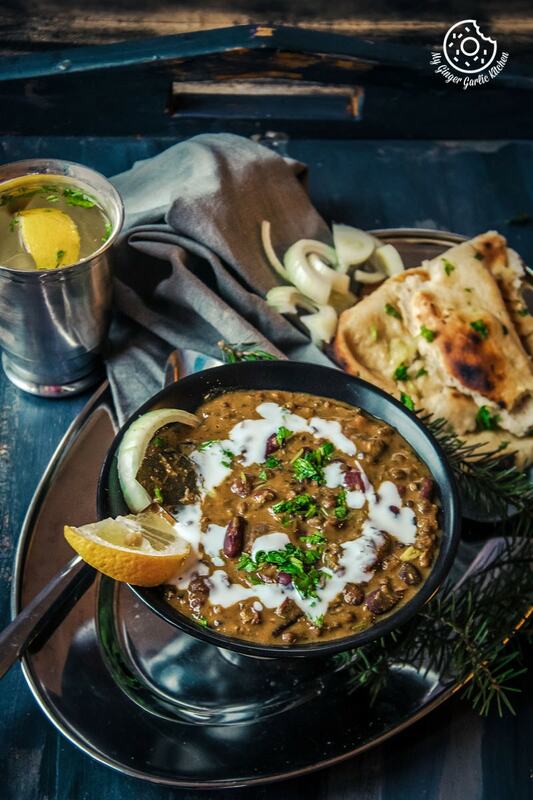 The key is not in the butter and cream — the key to make a flavorful dal makhani is the cooking process and amalgamation of right ingredients. The perfect marination of awesomely blended spices with lentils mix leads to a truly authentic and delicious dal Makhani. This is completely gluten-free and making it Vegan is super easy. To make a Vegan version, replace milk (or cream) with some almond milk. And use vegan margarine. I have made this lentils curry in a pressure cooker, but you can easily make it in an instant pot. Dal makhani aka ‘maa ki dal’ is known for its silky, melt-in-mouth texture and the classic and aromatic flavors. 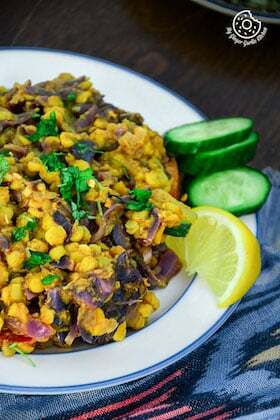 In simple words, I can say that this is one of the most exotic recipes from the Punjabi cuisine. 1. Rinse and soak sabut urad and rajma overnight in 5 cups of water. 2. Drain and rinse again. 3. Boil sabut urad and rajma in 3 cups of water with salt, ginger, garlic, onion and pressure cook for 8-1o whistles or till both the dals are soft and cooked completely. 4. Let the pressure come off and open the lid to see if the rajma is totally soft. Mash the dals with the back of a ladle. (You might need to pressure cook for 3 to 5 whistles more if the dal is not cooked). 5. Heat 3 tbsp of butter in a pan and add cumin seeds. 6. When they start to splutter, add ginger, garlic, and onion and sauté till they become golden in color. 7. Add tomatoes and sauté for 3-4 minutes. 8. Now add red chili powder, coriander powder, garam masala powder and sauté till the tomatoes are cooked. 9. Add this tempering to the cooked dal. Mix well and cook on high for 2 minutes. 10. Add milk/cream and ¼ cup of water and stir well. 11. Cook on low heat for about 15-20 minutes. Keep on stirring occasionally to make sure that dals don’t stick to the bottom of the pan. (Add more water if you think dal is too thick). 12. Add Kasuri methi and 1 tbsp of the butter and cook for 2 more minutes. 13. Dal should be really soft and well blended. Turn off the heat and garnish with fresh cream and coriander leaves. 14. Serve hot with Naan, paratha or chapati. 1. 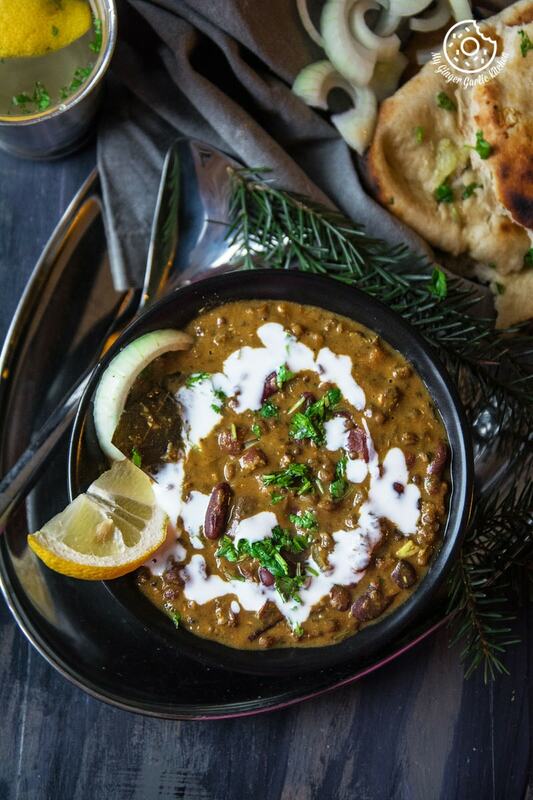 You can also make this Dal Makhani in an Instant Pot. 2. Swap butter/ghee with vegetable oil or nut butter for vegan version. 3. Authentic Dal Makhani requires whole urad, you can also add split urad dal. 4. Use cashew cream or almond cream instead of milk cream for vegan version.